Every job comes with its own unique tools of the trade. For electric lineworkers, those tools include personal protection equipment (PPE) to keep them safe as they work in what has been listed as one of the top 10 most dangerous jobs in the country. For years, many of Colorado’s electric coops shipped their lineworkers’ equipment as far away as Kansas and Iowa for regular safety testing. Much of that equipment was purchased from Western United Electric Supply Corporation. 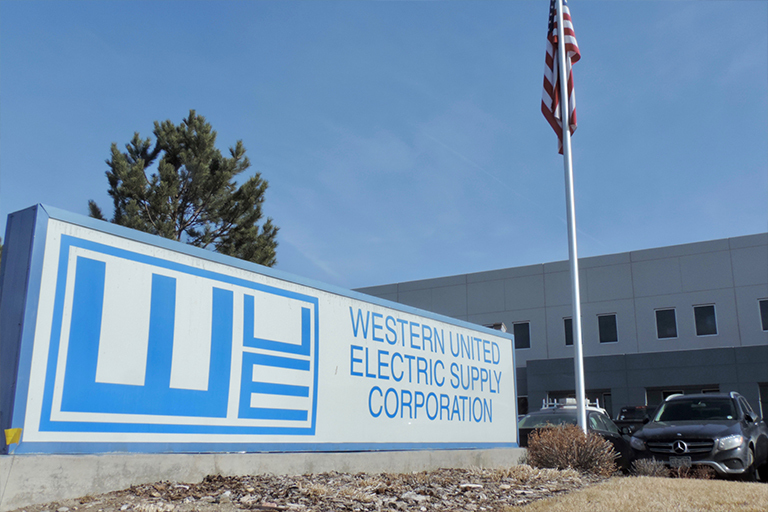 Western United was created as an electric materials distribution co-op by Colorado’s electric co-ops in 1976. Today it has 67 member co-ops across eight states with warehouses in Brighton, Colorado; Salem, Utah; and Albuquerque, New Mexico. Weekly supply shipments are sent to co-ops with materials needed for construction projects and other line work. However, Western United’s semi tractors then returned empty. 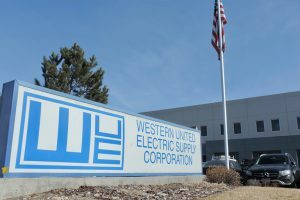 That led Western United CEO Mike Prom to a realization three years ago: If WUE built a test lab at its main Brighton facility, much of the lineworkers’ personal protection equipment that was being sent across the country for safety testing could come back to WUE on those otherwise empty delivery trucks. “We saw another opportunity to provide value to our members,” he said. 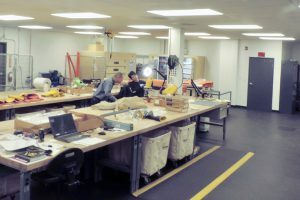 The idea to build a regional electrical rubber equipment test lab inside WUE’s Brighton building made so much sense that it was quickly accepted by the Western United board and by late 2015, it was up and running. Mike Prom and a Western United employee examine a glove in the test center. Western United’s development phase included visits to the highly regarded Cooperative Electric Energy Utility Supply test lab in South Carolina and the Colorado Springs Utilities test lab. It was important to Prom to look carefully at best practices and learn what does and doesn’t work, setting Western United’s lab up for success. The lab sits in an enclosed area inside Western United’s facility with its own air and humidity control. A full-time lab coordinator and rotating shifts of employees keep testing operations running nine hours a day, five days a week. Shipments of lineworkers’ gloves, sleeves and tools arrive daily. With a total of 80 customer utilities currently, that adds up to approximately 70,000 pieces of protective equipment tested per year in the lab. Prom says a commitment to customer service is key. “People like our two- to three-week turnaround — we focus heavily on this,” he said. Maintaining the highest possible level of testing efficiency and service requires specific processes and immense attention to detail, including a running track record for each glove tested in the lab. The glove owner’s name, testing dates and condition are all individually documented and the data is stored on Western United’s servers. 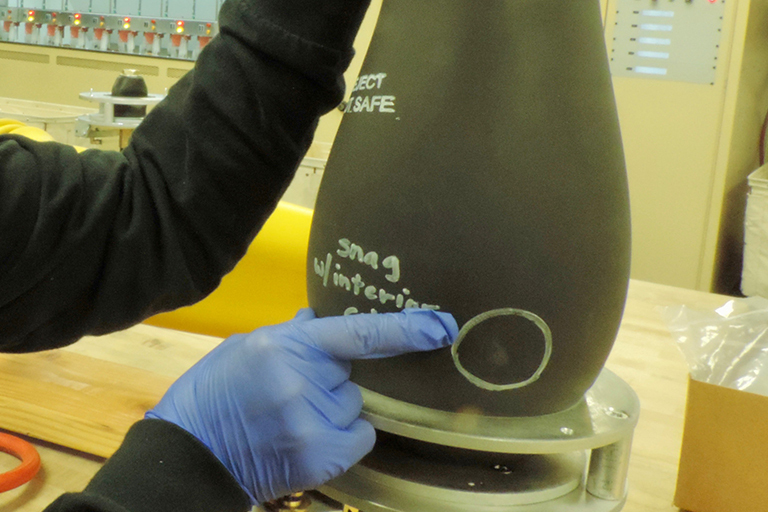 A test lab employee inspects a hole n a glove (circled in yellow). The Western United Electric Supply Corporation test lab is located inside its corporate office in Brighton. must be in operation for at least two years and meet rigorous onsite testing standards in order to achieve NAIL accreditation. “We got a very strong recommendation from them,” Prom said. With Western United’s Colorado test lab now being the only NAIL accredited lab in an 11-state region, it’s certain to attract even more co-ops and municipalities. With such tremendous growth in its short time of operation, WUE is in the process of adding duplicates for each machine in the lab, so operations will not be affected should one ever need to be taken out of service. WUE is also adding lab technicians to keep up with demand. In creating a respected regional safety test lab for its members, Western United’s goal of upholding cooperative principle six, “cooperation among cooperatives,” has been quickly realized and thousands of electrical lineworkers across the West are reaping the benefits. “It’s work and care and effort,” Prom said. “We love showing it off.” To schedule a tour of WUE’s test lab, contact Greg Mordini at gmordini@wue.coop or 720-880-7051. Mary Peck is a Colorado freelance writer with an extensive background in the electric cooperative industry. If you want to work where the action is, how about a job as an electric lineworker, keeping the electricity flowing throughout your community? Or, as a power use supervisor or member services representative, working with co-op members to find ways to reduce their electric bills by saving energy, utilizing renewable energy sources and making practical repairs around the home? “The electric power industry is one of the great American success stories and provides high-quality jobs that empower our nation’s economic growth. Behind every wall outlet or light switch, there is a dedicated workforce focused on powering the lives of millions of Americans who rely on electricity for nearly everything they do,” said Michael J. Bradley, president and founder of M.J. Bradley & Associates that recently conducted the study Powering America: The Economic and Workforce Contributions of the U.S. Electric Power Industry. The National Rural Electric Cooperative Association sponsored that study along with two other national utility groups to show how electric utilities power the economy as a result of lighting our homes and businesses. Powering America cites the utility industry as the most capital-intensive economic sector, investing more than $100 million per year on the nation’s electricity infrastructure with advances in technology, environmental protections and other improvements. That’s in addition to money spent on regular operations and maintenance. All that adds up to supporting more than 7 million jobs. More than 2.6 million of those jobs result from direct employment, like utility employees and contractors. As all those people go to work and live their lives, they create another 4.4 million “induced jobs” such as teachers, doctors, real estate agents and service workers. The report calculates the economic impact of the electric power industry at $880 billion, about 5 percent of the nation’s $18 trillion gross domestic product. The U.S. Department of Energy slices and dices those numbers a different way, shedding a little more light on wind-turbine technicians and other renewable energy jobs. Wind power jobs may be growing rapidly, but the DOE report listed solar energy jobs as the largest share of people working on all types of electricity generation. Almost 374,000 people are working in solar power — 43 percent of the electricity generation workforce. Wind employs about 100,000 people. Those renewable energy jobs are in addition to a raft of other careers in energy, from mining, to energy efficiency, power plant operators, and social media and cyber security specialists. Jobs at electric co-ops especially offer openings in cutting-edge careers, said Michelle Rostom, director of workforce development for NRECA. Lineworkers are always in high demand. Every year, Colorado’s electric cooperatives award scholarship opportunities to those looking into a career in linework. In 2017, a combined total of $384,000 in scholarships was awarded by several co-ops along with power suppliers Tri-State Generation and Transmission Association, based in Westminster, and Basin Electric Power Cooperative, headquartered in Bismarck, North Dakota. Part of the reason those jobs will be available is that the large Baby Boom generation is retiring — Rostom said 6,000 co-op employees retired last year. Other parts of the energy industry went through that wave of retirements several years ago, but Rostom said it’s just catching up with electric co-ops. “People stay at the co-op for so long because they’re great jobs with interesting work, a chance to grow professionally in a lot of different areas and they have a strong connection with their local communities,” she said. NRECA sees military veterans as part of the solution and began the Serve Our Co-ops; Serve Our Country veterans hiring initiative, which is another part of Rostom’s job as coordinator. “There are a lot of parallels between the military and cooperative principles, like teamwork, autonomy, independence and community,” Rostom said. Colorado’s electric cooperatives succeed because of those same standards and are always looking for ways to ensure their communities thrive as well. Paul Wesslund writes on cooperative issues for the National Rural Electric Cooperative. For more information about lineman training and career opportunities at Colorado’s electric cooperatives, visit our “Employment Opportunities” page.